Here are free resources for sharing award winning poetry books with young people. X.J. Kennedy. City Kids: Street & Skyscraper Rhymes. Ill. by Philippe Béha. Vancouver: Tradewind Books, 2010. Here is a Readers' Guide by Brienna Ayers. Bibliography: Kennedy, X. J. (2010). City Kids: Street and Skyscraper Rhymes. Ill. by Philippe Béha. Toronto, Ontario: Trade Wind books. 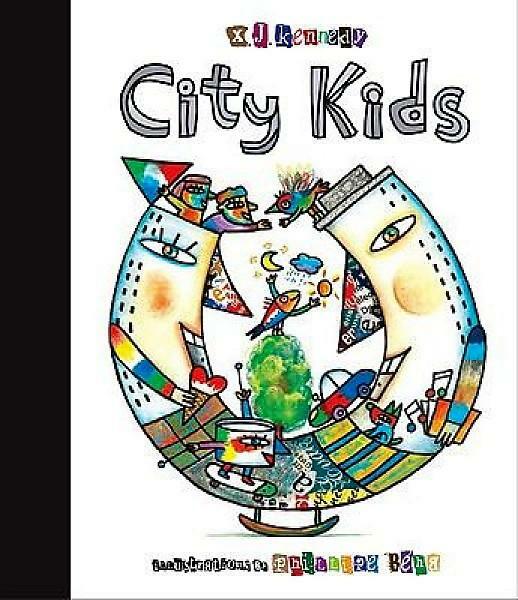 Summary of Book: City Kids is a collection of poems focused on the places, people and experiences one may encounter in a city. Kennedy creates poems about the places one may visit in a big city like the San Diego Zoo, a Laundromat or a deli. There are many poems about people one would experience like a man passing out leaflets, a man at a chestnut cart, street performers, fireman and even the perspective of a dog. This collection of Kennedy’s poetry focuses on the diversity of life in a city. There is even a poem specifically about the importance of diversity in life. X.J. Kennedy is the winner of the 2009 Robert Frost Medal awarded by the Poetry Society of American for a distinguished lifetime of service to American Poetry. Phillippe Béha is the two time Governor-General’s Award-winning illustrator of many children’s books. *Both have received many other awards for their work in Children’s Literature. • Ask students to name some of the big cities they can think remember. • Ask students to share about a time they lived in or visited a big city. • Ask students what kind of things would they write about in a book of poetry about the city? Is there anything they think has to be included in a poetry book about a city? • Allow students to volunteer to read the shorter poems (“hoop haiku” or “Where Will We Run To” would be good choices) or do a round robin with students reading every other line. This keeps the student’s attention on the material and provides practice with their oral reading skills. • Read a title (“Aquarium” would be a good choice) from the collection and have students guess what the poem will be about or read the poem aloud and have the students try and guess what the poem is titled/ about. • Separate the titles, poems and images (use some of the simpler poems like “Leaflet man” or Subway trip”) and divide the students into groups. Each group is given several of these divided poems and are tasked to match the correct title, poem and image. • Have students create poems about things in their neighborhoods and people in their lives. Poems could also be about other areas of town and people they have observed. • Have students select 2-3 poems from X.J Kennedy’s collection and create a story that includes both concepts. For example, if they chose a poem about school and a poem about diversity they could write about diversity in a school. • Have students create a collage of the images found in the City Kids collection of poetry. • Have students illustrate their poems about things in their neighborhoods and people in their lives. • Have students find the locations of the cities mentioned in the collection of poetry or other similar big cities they can think imagine. These cities can be marked on the map and the class can discuss the growth of cities as well. I never read this before, and I am about to order it right now! Thank you very much, Brienna, for this informative post and introduction to yet another fabulous X.J. Kennedy book. Off to order! a. The Lion and the Unicorn Award for Excellence in North American Poetry focuses on North American poetry for young people and carries on the prior tradition begun by the British journal, Signal, to “instigate, provoke, and sustain a conversation about poetry published for children.” Recipients are now from both the U.S. and Canada. 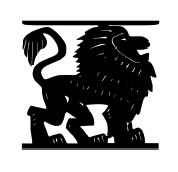 In addition, the Lion and the Unicorn Award includes an essay which discusses the award winners as well as speculates on issues unique to writing and publishing poetry for children, “painting a picture of that year in children’s poetry.” You can generally find those thought-provoking essays in Project Muse, a digital resource of journals in the humanities and social sciences. Brown, Calef. 2015. Hypnotize a Tiger. Poems About Just About Everything. New York: Henry Holt. Nelson, Marilyn. 2014. How I Discovered Poetry. Illustrated by Hadley Hooper. New York: Penguin. Snicket, Lemony. 2014. 29 Myths on the Swinster Pharmacy. Illustrated by Lisa Brown. McSweeney's McMullins. Dana Teen Lomax, ed. 2013. Kindergarde: Avant-Garde Poems, Plays, Stories, and Songs for Children. Illus. Cliff Hengst. Lafayette: Black Radish. JonArno Lawson. 2013. Enjoy It While It Hurts. Illus. JonArno Lawson. Hamilton, Ontario: Wolsak. Lawson, Jon Arno. 2012. Down in the Bottom of the Bottom of the Box. Illustrated by Alec Dempster. Ontario: The Porcupine's Quill. Adoff, Arnold. 2010. Roots and Blues: A Celebration. New York: Houghton Mifflin Harcourt. Nan Forler. Winterberries and Apple Blossoms: Reflections and Flavors of a Mennonite Year. Ill. by Peter Etril Snyder. Ontario: Tundra Books, 2011. Paul B. Janeczko. Requiem: Poems of the Terezín Ghetto. Cambridge, MA: Candlewick, 2011. Susan Blackaby. Nest, Nook & Cranny. Ill. by Jamie Hogan. Watertown, MA: Charlesbridge, 2010. Rob Jackson. Weekend Mischief. Ill. by Mark Beech. Honesdale, PA: Wordsong/Boyds Mills Press, 2010. JonArno Lawson. A Voweller’s Bestiary, from Aardvark to Guineafowl (and H). Erin, Ontario: Porcupine’s Quill, 2008. Helen Frost. Diamond Willow. New York: Farrar, Straus & Giroux, 2008. William H. New. The Year I Was Grounded. Vancouver: Tradewind Books, 2008. Linda Sue Park. Tap Dancing on the Roof: Sijo (Poems). Ill. by Istvan Banyai. New York: Clarion, 2007. Jay M. Harris. The Moon Is La Luna: Silly Rhymes in English & Spanish. Ill. by Matthew Cordell. Boston: Houghton Mifflin, 2007. Carole Boston Weatherford. Birmingham, 1963. Honesdale, PA: Wordsong/Boyds Mills Press, 2007. JonArno Lawson. Black Stars in a White Night Sky. Ill. by Sherwin Tjia. Toronto: Pedlar Press, 2006. Jorge Argueta. Talking with Mother Earth/Hablando con Madre Tierra. Ill. by Lucía Angela Pérez. Toronto: Groundwood/House of Anansi, 2006. Helen Frost. The Braid. New York: Frances Foster/Farrar Straus & Giroux, 2006. Walter Dean Myers. Jazz. Ill. by Christopher Myers. New York: Holiday House, 2006. Walter Dean Myers. Street Love. New York: Amistad/HarperTempest, 2006. Wynton Marsalis. Jazz A·B·Z: An A to Z Collection of Jazz Portraits. Ill. by Paul Rogers. Somerville, MA: Candlewick, 2005. Marilyn Nelson. A Wreath for Emmett Till. Ill. by Philippe Lardy. Boston: Houghton Mifflin, 2005. Naomi Shihab Nye. A Maze Me: Poems for Girls. Ill. by Terre Maher. New York: Greenwillow, 2005. Shel Silverstein. Runny Babbit: A Billy Sook. New York: HarperCollins, 2005. Marilyn Nelson. Fortune’s Bones: The Manumission Requiem. Asheville, NC: Front Street Books, 2004. Helen Frost. Spinning Through the Universe: A Novel in Poems from Room 214. New York: Farrar, Straus & Giroux, 2004. JonArno Lawson. The Man in the Moon-Fixer’s Mask. Toronto: Pedlar Press, 2004. Walter Dean Myers. Here in Harlem: Poems in Many Voices. New York: Holiday House, 2004. Allan Wolf. New Found Land: Lewis and Clark’s Voyage of Discovery. Somerville, MA: Candlewick, 2004. This site was created by Sylvia Vardell and is not an official site of the Lion and Unicorn Award. Contributors include librarians, teachers, and students who want to promote the award and honor books as well as poetry in general among children and young adults.